The Film Corner with Greg Klymkiw: DOWNTIME - Review By Greg Klymkiw - The forgotten, neglected 1985 Prairie Post-Modernist Classic of Canadian Cinema, sprung from the same asbestos-tainted waters of Winnipeg that yielded the legendary John Paizs and Guy Maddin has been lovingly restored and remastered for Home Viewing on DVD. DOWNTIME - Review By Greg Klymkiw - The forgotten, neglected 1985 Prairie Post-Modernist Classic of Canadian Cinema, sprung from the same asbestos-tainted waters of Winnipeg that yielded the legendary John Paizs and Guy Maddin has been lovingly restored and remastered for Home Viewing on DVD. An array of Welcoming abodes offer solace & warmth to the single working man or woman. From Classical to Moderne: in Winnipeg, the choice is ALL YOURS and WHAT a choice it IS!!! It always seemed perversely appropriate that Greg Hanec and Mitchell Brown's extraordinary 1985 film Downtime should be so unjustly neglected, forgotten and lost to the windy vagaries of imagined memories of time and place. Not that great art deserves to neglected, but cream, no matter how long it takes, always rises to the top. The richness of the picture is how it is a product of its time and reflective of the period it actually represented from conception through to its completion. If the movie was met with the sort of indifference that eventually blots work out, obliterating its very being from a collective consciousness of great regional DIY independent cinema, then Downtime is, I think, on the verge of having the last laugh (so to speak) since now, more than ever, almost thirty years after it was born, it's due for rediscovery and serious consideration. people can be seen on the street. 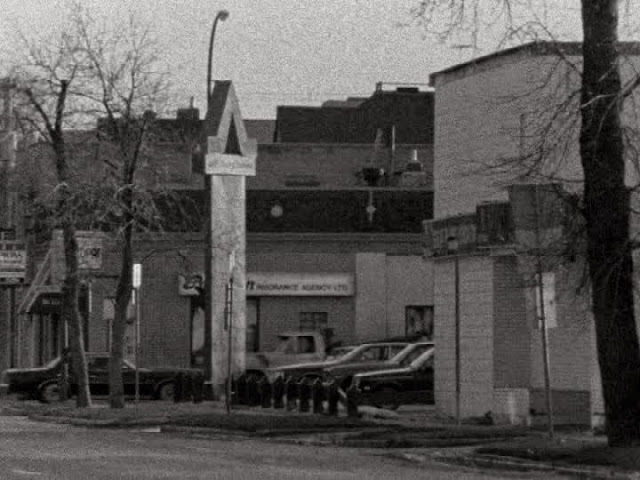 That Hanec and Brown's picture was made and set in Winnipeg during the heyday of the Prairie Post-Modernist phase, coined and identified by film critic Geoff Pevere in "Cinema Canada", is what makes the movie even more ripe for rediscovery. Made the same year Guy Maddin directed his first film, the hauntingly grotesque short The Dead Father and as legendary Winnipeg Film Group auteur John Paizs was embarking upon his emblematic first feature Crime Wave, Hanec as a filmmaker was also forging his own unique style - a kind of deadpan neo-realistic portrait shot in gloriously grainy black and white, presented in lovely standard frame tableaux, complete with blackouts between shots from a mostly fixed camera position. Timing, they say, is everything, but for those living in Winnipeg during those weirdly lithium-infused days, the rest of the world just didn't matter. It DID, however, matter in the case of this particular film. 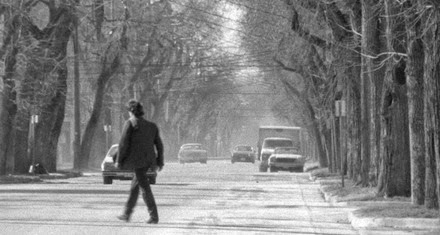 Once it was complete and about to enter the world, the Zeitgeist of the mid-80s delivered another film in black and white, shot tableau style and equipped with blackouts between scenes, Jim Jarmusch's Stranger Than Paradise. Though there are stylistic similarities, they're ultimately very different films. The world, however, can be extremely short-sighted. Jarmusch's film premiered at the Cannes Film Festival, then platformed and eventually widened out theatrically as Hanec was in the process of sending his film out to be considered for festival play. 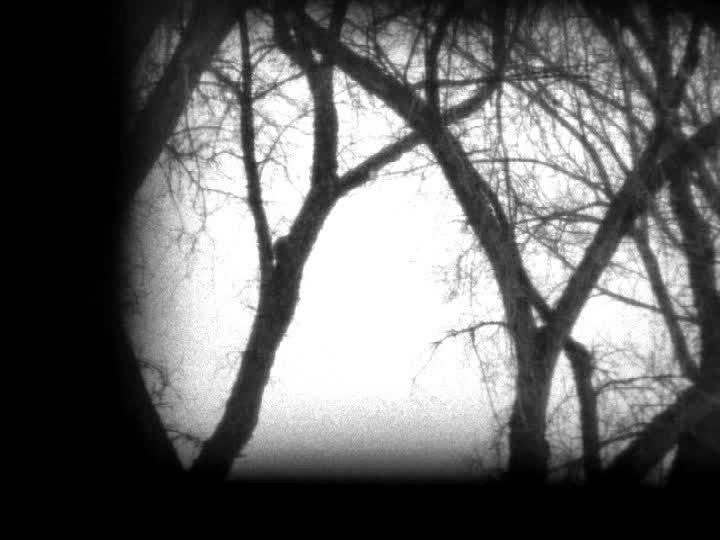 Talk about having the rug pulled out from under your film. That said, Hanec and Brown's movie was invited to participate in the 1986 Berlin International Film Festival's prestigious Forum of New Cinema section. The Berlinale was a perfect place for Downtime to greet the world with its own special howdy-doody from Winnipeg. Hanec journeyed to the festival and found himself surrounded by some of the best in World Cinema: Derek Jarman's Caravaggio, James Foley's At Close Range and Alan Rudolph's Trouble in Mind were amongst the Official Competition entries. The Panorama section was unveiling Clint Eastwood's Honkytonk Man, Gus Van Sant's Mala Noche and Lasse Hallstrom's My Life As a Dog. In the Forum of New Cinema, Hanec's Downtime unspooled alongside the likes of Peter Greenaway's A Zed & Two Noughts, Jouis Malle's God's Country and Claude Lanzmann's Shoah. Not bad company for a 65-minute mid-length feature film by a nice, young Ukrainian Boy from Winnipeg. Downtime was, however, swallowed to a good extent in the shadow of Stranger Than Paradise and as surprisingly as its original take on contemporary youth culture was, Hanec's picture promptly and summarily disappeared. Recently and lovingly restored for home consumption on DVD, Downtime is out in the world now and appropriately, it's not too long after the major "Forgotten Winnipeg" music and film retrospective presented by the Winnipeg Symphony Orchestra's Festival of New Music in collaboration with SPUR. The film might have been forgotten for nearly three decades, but it only makes sense since Winnipeg, named from the Cree words "muddy" and "water" is a city hidden beneath fluffy snowflakes of forgetfulness, swirling about under dark waters of time, the city's amnesiac qualities emanating throughout the world and oft-inspiring repression of that which should not be repressed. Repression is Winnipeg and it rubs off in the strangest places. And so it is, that Winnipeg is indeed featured front and centre in this graceful ode to slacking when slacking was actually happening big time and no more big time than in Winnipeg, the North American Centre of slacking. Focusing on a quartet of lonely young Winnipeggers, Hanec renders Mitchell Brown's evocative and superbly constructed screenplay using each individual scene as a single shot in tableau. Much of the film plays like a still life, each frame teeming with a kind of laconic intensity as Brown's script deftly confounds all expectations. people like to party, eh. We meet a young woman (Maureen Gammelseter) working day shift in a depressingly claustrophobic variety store, its windows thick with dust on the inside and outdoors, filmy grime clinging to the same windows - the result of Winnipeg winds pelting springtime dirt from poorly-cleaned streets, piled high with sand laid down in winter to temper the almost sub-actic ice on the roads. Though it seems like the sun is shining outside, it's filtered through the store's glass windows of misery and neglect. The young woman manning the cash register doesn't even have a name. Why should she? It's Winnipeg. As one of the city's sleepwalking denizens, she's pretty much as inconsequential as humanity gets, though she is alive and appears to have some manner of survival instinct within her. there is plenty to think about. A young man (Padraic O'Beirn), also bereft of a name, enters the store to buy a carton of milk. Though his face bears a kind of Buster Keaton countenance, his eyes have the slightest light in them, which suggest he might not only be a nice guy, but a well-humoured one as well. The film puts this to the test immediately as it leads up to the promise of the kind of classic moments one experiences in the movies, especially those in which lonely young people find each other in the unlikeliest circumstances. He dawdles about the store until nerving-up enough to ask the young woman out. Will she accept? Really? Truly? Madly? Deeply? Why not? Her countenance of blankness suggests she probably has little else to do in her downtime from work. Alas, she declines and our young man leaves. When she finally gets off work, she retires to her spartan, greyish-walled apartment and sits on a chesterfield. She's been on her feet all day. It must surely be a relief to sit. And sit. And sit. And - wait for it - sit. As twilight fills the big prairie skies over the drabness that is Winnipeg, we follow our young man as he begins his challenging night shift as a janitor in a school: mopping, draining, mopping, draining and, when it seems like something else awaits, he attentively mops, then skillfully drains, emptying grey water into the properly chosen receptacle within a dank, dark hovel identified on its door as the "Sink Room". Yup, it's a barn-burner of a night in Winnipeg. The young woman does what all single young women in Winnipeg do. She saunters down the street and, with not-so baited breath, enters the Coin Laundromat. The plot thickens. Here, under the pulsating fluorescent lights, a kooky elfin waif with a NAME, Debbie (Debbie Williamson), strikes up a friendly, but almost painfully inconsequential conversation with our heroine. Eventually, the young woman accepts Debbie's invitation to go to a party later in the week. And what a week doth unfurl. The young woman goes to work. The young man spends his days wandering aimlessly or staring from behind his blankets at the blank walls of his apartment. 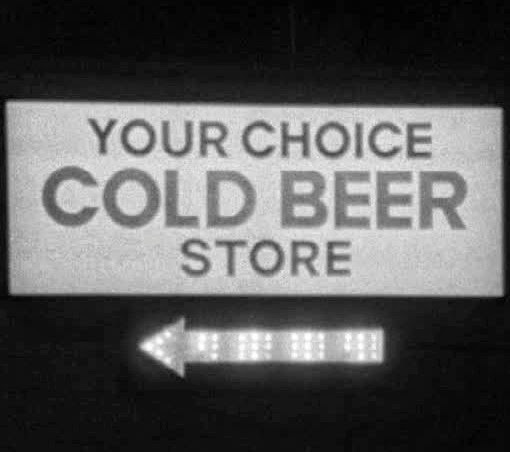 The young woman stands rigidly at her post behind the counter of the variety store as an occasional customer graces it with their presence. Her conversations with these customers are automaton-like and perhaps even more blankly-stock than those uttered by McDonald's counter servers. At night, she goes home. She boils up the contents from within whatever tin can is handiest to reach within her cupboard. Meanwhile, the young man is, of course, mopping - mopping floors in the dead of a Winnipeg night. It doesn't take too long to assume he really needs to go out on a date or something. He'll try to charm the young woman again and one of his attempts truly confounds expectations. (To my knowledge, the wooing attempt employed is perhaps the first time it's ever been unveiled in movie history.) You'll want to give the young man points for this one, but he carries it off so pathetically, you'll be forced to dock a whole whack o' points from his highly original, but utterly botched approach. On the night of the party, Debbie brings along a friendly, laconic young man who - lo and behold - has a name. Ray (Ray Impey) seems like he's perhaps got the stuff to sweep our heroine off her feet, but she really seems to have eyes for nobody and the plot, as always, must thicken. And I assure you, it does. Though this is, ultimately, a movie about slacking, the slacking is completely without aim of any kind. I fondly recall my own slacking period during the mid-80s when goals included randomly stalking young women or going to flea markets in search of Zippo lighters. Not so with the Downtime Winnipeggers. They are truly aimless. Boredom is what ultimately rules the day and even when a male-female coupling eventually occurs, it seems rife with the kind of bliss that can only be derived when propelled to Mount Olympus heights of boredom. If you're looking for a sound-barrier-breaking level of dull inactivity, you ain't seen nothing until you've seen Downtime. 1. Time during which a machine, especially a computer, is out of action or unavailable for use. 1.1 A time of reduced activity or inactivity. Oxford defines, with the aforementioned, the central dramatic action that fuels Greg Hanec's exquisite film - a $15,000 feature that's stood the test of time and that now, seems a perfect movie, for today. POSTSCRIPT: Greg Hanec finally met Jim Jarmusch during the Winnipeg Symphony Orchestra's New Music Festival in January 2014. In fact, Hanec, an accomplished musician and composer in addition to his filmmaking talents joined up with Jarmusch as part of his backup band when he performed a special gig at Winnipeg's Union Sound Hall with Lea (Sonic Youth) Ranaldo. Jarmusch now owns a DVD of Downtime. DOWNTIME has been remastered from original elements to DVD, it can now be purchased directly online. Dir. Greg Hanec | Canada 1985 | 66min.